Download "Type I error rates and power analyses for single-point sensitivity measures"
1 Perception & Psychophysics 28, 7 (2), doi:.3758/pp Type I error rates and power analyses for single-point sensitivity measures Caren M. Rotello University of Massachusetts, Amherst, Massachusetts Michael E. J. Masson University of Victoria, Victoria, British Columbia, Canada and Michael F. Verde University of Plymouth, Plymouth, England Experiments often produce a hit rate and a false alarm rate in each of two conditions. These response rates are summarized into a single-point sensitivity measure such as d, and t tests are conducted to test for experimental effects. Using large-scale Monte Carlo simulations, we evaluate the Type I error rates and power that result from four commonly used single-point measures: d, A, percent correct, and γ. We also test a newly proposed measure called γ C. For all measures, we consider several ways of handling cases in which false alarm rate 5 or hit rate 5. The results of our simulations indicate that power is similar for these measures but that the Type I error rates are often unacceptably high. Type I errors are minimized when the selected sensitivity measure is theoretically appropriate for the data. A common experimental design asks subjects to classify a test stimulus into two categories (target or lure, Category A or B, or signal present or absent), using a binary-valued response. The resulting data can be summarized with two numbers: the hit rate (H), which is the probability of saying yes to a target, and the false alarm rate (F ), which is the probability of saying yes to a lure. From these response proportions, one can estimate the subjects ability to discriminate the two classes of stimuli, as well as their general bias to prefer one response over the other. A variety of indexes meant to quantify discrimination sensitivity have been proposed, including d (Tanner & Swets, 954), A (Pollack & Norman, 964), H 2 F, percent correct, and γ (Nelson, 984). In this article, we examine two statistical properties of these measures that are of particular interest in an experimental setting: Type I error rate and power. In evaluating these statistical properties, obvious considerations include the size of the sample and the number of trials per condition. Less obvious but equally important is the structure of evidence in the environment. We can get a sense of this structure from the receiver operating characteristic (ROC), which plots all possible (F, H ) pairs as response bias varies but sensitivity remains constant. Each of the sensitivity indexes produces ROCs of a particular shape, and this constrains the form of the evidence distributions that underlie the ROC (see Swets, 986b). In other words, each sensitivity measure makes an assumption about how evidence is distributed, and the degree to which the assumption matches reality will affect its statistical performance. As will be seen later, this factor interacts with the true level of sensitivity and response bias. In our evaluation, we test two types of evidence distributions most prominent in the theoretical literature: Gaussian (both equal and unequal variance) and rectangular. Calculation of d as a summary of discrimination performance entails the assumption that the underlying distributions are equal-variance Gaussian. The distance between the means of the two distributions is measured by d in units of their common standard deviation. It is easy to calculate: d 5 z(h) 2 z(f), () where the z transformation takes a response proportion and yields a z score. One advantage of d over other measures in this equal-variance Gaussian scenario is that it is independent of response bias. That is, the same value of d is observed regardless of whether subjects are relatively conservative or liberal in their yes responses. If the underlying distributions are Gaussian but do not have a common variance, as is often the case in recognition memory tasks (Ratcliff, Sheu, & Gronlund, 992), d is not independent of bias. Calculating percent correct, p(c), as a summary statistic is appropriate when the underlying strength distributions are rectangular in form. Given equal numbers of target and lure trials at test, C. M. Rotello, 389 Copyright 28 Psychonomic Society, Inc.
2 39 Rotello, Masson, and Verde p() c = [ H + ( F)] = ( H F) +. (2) As Equation 2 shows, p(c) is linearly related to the popular corrected recognition score, H 2 F, that subtracts the false alarm rate from the hit rate in an attempt to correct for guessing or for response bias. In many empirical situations, of course, the form of the underlying representation is not known. For that reason, nonparametric, one-size-fits-all measures of sensitivity are desirable. Two putatively nonparametric measures have been proposed: A and γ. A is an estimate of the area under the ROC. Although the area under the full ROC is a truly nonparametric measure of performance, using a single (F, H) pair to estimate that area, as in the calculation of A, requires a number of assumptions that render A parametric after all (Macmillan & Creelman, 996). A is consistent with rectangular distributions when sensitivity is high and with logistic distributions when sensitivity is low (logistic and Gaussian distributions are hard to distinguish in an experimental setting). Calculation of A differs for above- and below-chance performance: A ( H F)( H F) if H F, (3A) 2 4H( F) and A ( F H)( F H) if F H. (3B) 2 4F( H) A different apparently nonparametric measure, γ (Goodman & Kruskal, 954), has been heavily used in the metacognition literature (e.g., Koriat & Bjork, 26; Weaver & Kelemen, 997). Nelson (984, 986a) argued that the simplest measure of a subject s sensitivity in a task is just the probability, V, that they will judge A to have a greater value than B on a dimension of interest (say, memory strength), given that it objectively does. Nelson (986b) showed that γ = 2V = H F H + F 2HF. (4) Masson and Rotello (27) recently showed that empirically estimated γ systematically deviates from its true value unless distribution-specific correction methods are applied. Thus, γ is a parametric measure of sensitivity. 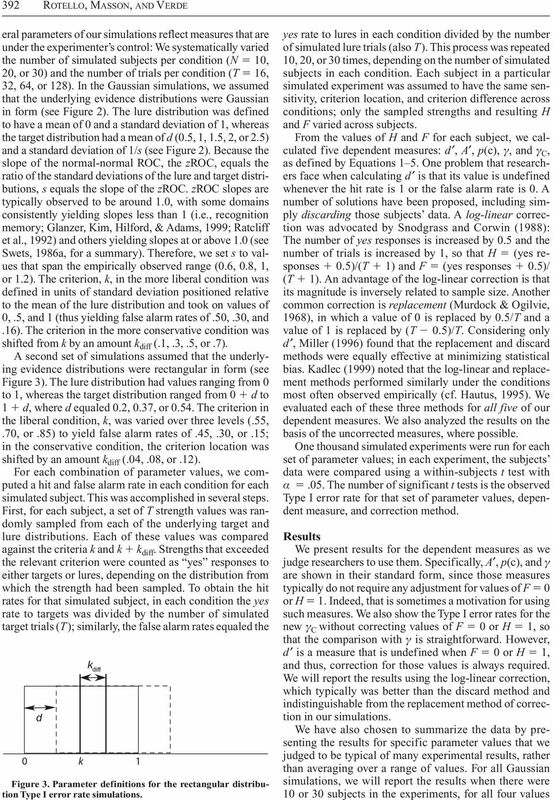 Masson and Rotello developed a measure called γ C that assumes that the underlying strength distributions are rectangular in form and that an equal number of targets and lures are tested. In that case, they showed that γ C 5 2(H 2 F) 2 (H 2 F) 2. (5) Therefore, γ C is monotonic with percent correct over the range of observable (F, H) values. Questions about the statistical properties of some of these sensitivity indices have previously been raised. The bias and precision of d and A have been studied fairly thoroughly (Hautus, 995; Kadlec, 999; Miller, 996; Verde, Macmillan, & Rotello, 26). Their robustness to violations of their equal-variance assumptions has also been explored (Balakrishnan, 998; Donaldson, 993; Verde et al., 26). 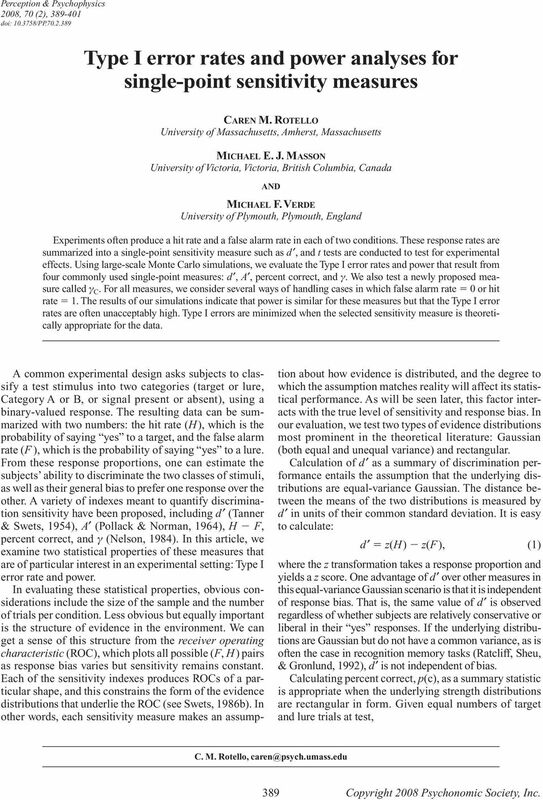 In this article, we ask two different statistical questions about each of these single-point sen- sitivity statistics: () Given two experimental conditions that differ only in response bias, what is the Type I error rate for the (correct) null hypothesis that the mean difference between the two conditions is zero, and (2) given two experimental conditions that differ only in sensitivity, what is the power of each measure to detect the sensitivity difference? The answers to these questions likely depend on a variety of factors, such as the number of subjects and trials in each condition, the magnitude of the criterion location or sensitivity differences between conditions, and the form of the underlying evidence distributions. To our knowledge, only one study has previously asked these questions. Schooler and Shiffrin (25) evaluated the power of d, γ, and H 2 F to detect differences in true d between two conditions and the Type I error rate of each measure when the two conditions differ only in response bias. They ran Monte Carlo simulations of both experimental situations, assuming equal-variance Gaussian distributions. To estimate power, the simulated sensitivity levels were very high: d had an expected value of 2 in the weaker condition and of 3 in the stronger condition; the decision criterion was either unbiased, or fell one standard deviation above or below that neutral point (i.e., c 5,, or 2). The Type I error rate simulations used the same parameter values but made comparisons within a particular strength condition. Their primary interest focused on cases in which a researcher is able to obtain only a small number of observations per condition per subject (i.e., 3,, or 2). Therefore, in addition to evaluating power and Type I error rates, using a familiar repeated measures t test, they also adopted two bootstrap-based approaches that were better suited to small sample sizes. 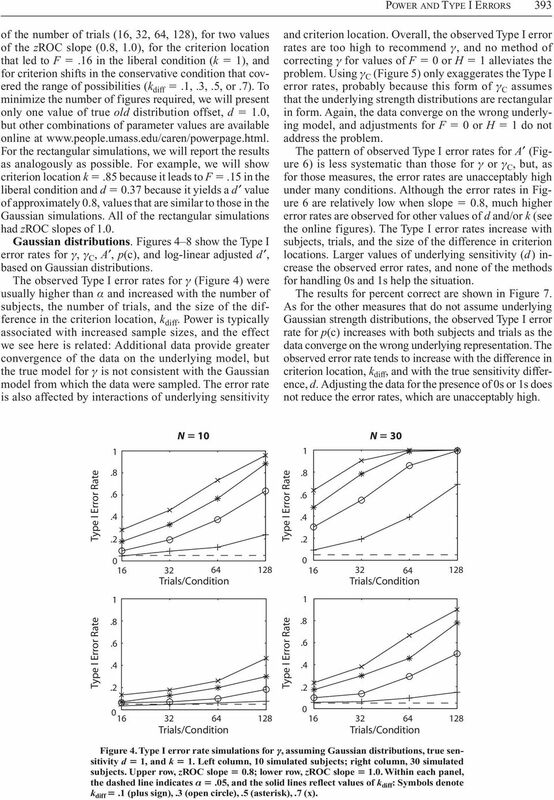 Schooler and Shiffrin s (25) findings and recommendations can be grouped by dependent measure (d, γ, H 2 F ) and analysis method (t test, bootstrap methods). The corrected recognition score H 2 F performed poorly, yielding relatively low power and high Type I error rates, regardless of analysis method. Considering only the t test approach that we judge most researchers use, neither d nor γ was a clear winner: Although d had consistently higher power than did γ, that advantage was offset by a correspondingly greater Type I error rate. Given the clear desire to control Type I error rates, Schooler and Shiffrin concluded that γ is the best single-point dependent measure to use with t tests. 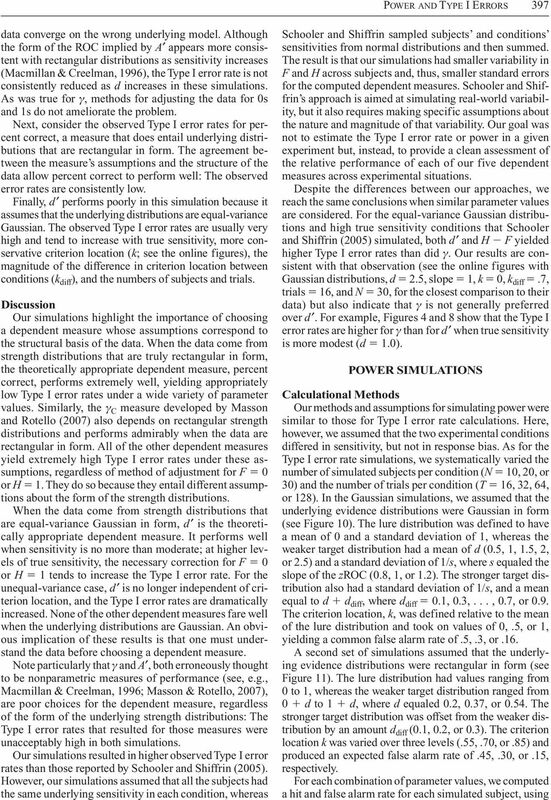 Schooler and Shiffrin s (25) simulations provide some guidance for researchers conducting studies in which there are few trials per subject and high performance (d 5 2 or greater), as well as underlying distributions that are known to be equal-variance Gaussian. We were interested in exploring the properties of single-point measures of sensitivity over a broader range of experimental parameters. To that end, we conducted simulations that varied in the number of subjects and trials per subject, as well as the form of the underlying distributions (rectangular or Gaussian in both equal- and unequal-variance forms). Similarly, we varied the true sensitivity levels and criterion locations over a wide range. 3 Pow e r and Type I Errors 39. Choose distributional form (Gaussian, rectangular). Choose parameters for each of 2 conditions that differ only in: (a) criterion location (Type I simulations) or (b) sensitivity (power simulations). 2. Sample T Old and T New trials in each condition for Subject i. Compute H and F rates, and apply each correction for and. Compute all sensitivity statistics in both conditions. 3. Repeat Step 2 to generate N subjects, creating a simulated experiment. 4. Run a within-subjects t test on each dependent measure, with H : mean betweencondition sensitivity difference. For Type I simulations, the Null is true. For simulations, the Null is false. There are 2 such t tests for each simulated experiment: 5 sensitivity statistics 4 correction methods (none, replacement, log-linear, discard), each with a maximum of N degrees of freedom. 5. Repeat Steps 2 4, times. Calculate the proportion of significant t tests for each measure correction combination. For Type I simulations, the proportion is the Type I error rate. For simulations, the proportion is. 6. Repeat Steps 5 for each combination of parameter values. Figure. The sequence of steps involved in the simulation procedure. Simulations Imagine a situation in which two conditions result in the same underlying evidence distributions but a different response bias. For example, Dougal and Rotello (27) showed that negatively valenced emotional stimuli, relative to neutral stimuli, produce a liberal shift in response bias but leave discrimination unchanged. In experiments such as this, the researcher often conducts a t test to compare sensitivity in the two conditions; a correct decision for the sensitivity difference occurs when the null hypothesis cannot be rejected. A Type I error results whenever the two conditions are declared to differ reliably in terms of sensitivity. We explored the performance of the various sensitivity measures in this general scenario, under different assumptions about the form of the underlying distributions and the magnitude of the response bias difference between conditions. Calculational Methods We ran a large number of Monte Carlo simulations under a wide-ranging set of assumptions. Figure outlines the sequence of steps involved in these simulations. Sev- k diff σ5 σ5/s k µ5d Figure 2. 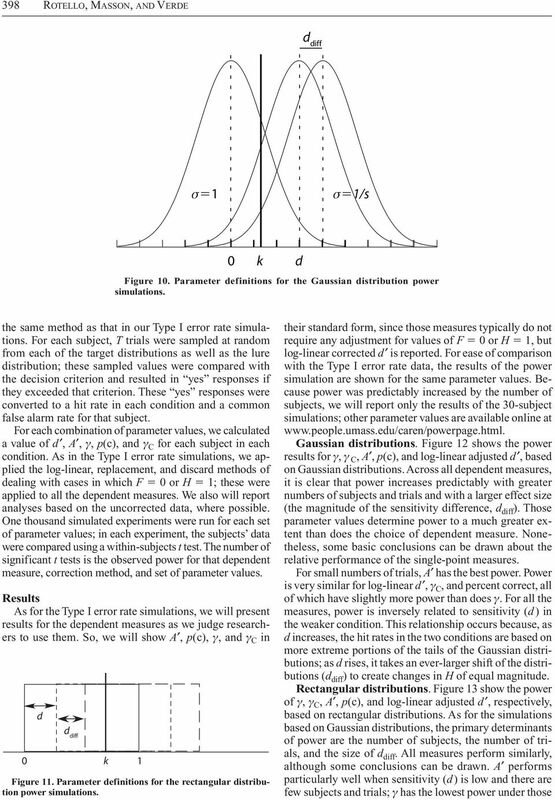 Parameter definitions for the Gaussian distribution Type I error rate simulations. 5 Pow e r and Type I Errors 393 of the number of trials (6, 32, 64, 28), for two values of the zroc slope (,. ), for the criterion location that led to F 5 in the liberal condition (k 5 ), and for criterion shifts in the conservative condition that covered the range of possibilities (k diff 5.,.3,, or.7). To minimize the number of figures required, we will present only one value of true old distribution offset, d 5., but other combinations of parameter values are available online at For the rectangular simulations, we will report the results as analogously as possible. For example, we will show criterion location k 5 5 because it leads to F 5 in the liberal condition and d 5.37 because it yields a d value of approximately, values that are similar to those in the Gaussian simulations. All of the rectangular simulations had zroc slopes of.. Gaussian distributions. Figures 4 8 show the Type I error rates for γ, γ C, A, p(c), and log-linear adjusted d, based on Gaussian distributions. The observed Type I error rates for γ (Figure 4) were usually higher than α and increased with the number of subjects, the number of trials, and the size of the difference in the criterion location, k diff. is typically associated with increased sample sizes, and the effect we see here is related: Additional data provide greater convergence of the data on the underlying model, but the true model for γ is not consistent with the Gaussian model from which the data were sampled. The error rate is also affected by interactions of underlying sensitivity and criterion location. Overall, the observed Type I error rates are too high to recommend γ, and no method of correcting γ for values of F 5 or H 5 alleviates the problem. Using γ C (Figure 5) only exaggerates the Type I error rates, probably because this form of γ C assumes that the underlying strength distributions are rectangular in form. Again, the data converge on the wrong underlying model, and adjustments for F 5 or H 5 do not address the problem. The pattern of observed Type I error rates for A (Figure 6) is less systematic than those for γ or γ C, but, as for those measures, the error rates are unacceptably high under many conditions. Although the error rates in Figure 6 are relatively low when slope 5, much higher error rates are observed for other values of d and/or k (see the online figures). The Type I error rates increase with subjects, trials, and the size of the difference in criterion locations. Larger values of underlying sensitivity (d) increase the observed error rates, and none of the methods for handling s and s help the situation. The results for percent correct are shown in Figure 7. As for the other measures that do not assume underlying Gaussian strength distributions, the observed Type I error rate for p(c) increases with both subjects and trials as the data converge on the wrong underlying representation. The observed error rate tends to increase with the difference in criterion location, k diff, and with the true sensitivity difference, d. Adjusting the data for the presence of s or s does not reduce the error rates, which are unacceptably high. N N Figure 4. Type I error rate simulations for γ, assuming Gaussian distributions, true sensitivity d 5, and k 5. Left column, simulated subjects; right column, 3 simulated subjects. Upper row, zroc slope 5 ; lower row, zroc slope 5.. Within each panel, the dashed line indicates α 5, and the solid lines reflect values of k diff : Symbols denote k diff 5. (plus sign),.3 (open circle), (asterisk),.7 (x). 6 394 Rotello, Masson, and Verde N N Figure 5. Type I error rate simulations for γ C, using the same parameter values as those in Figure 4. N N Figure 6. 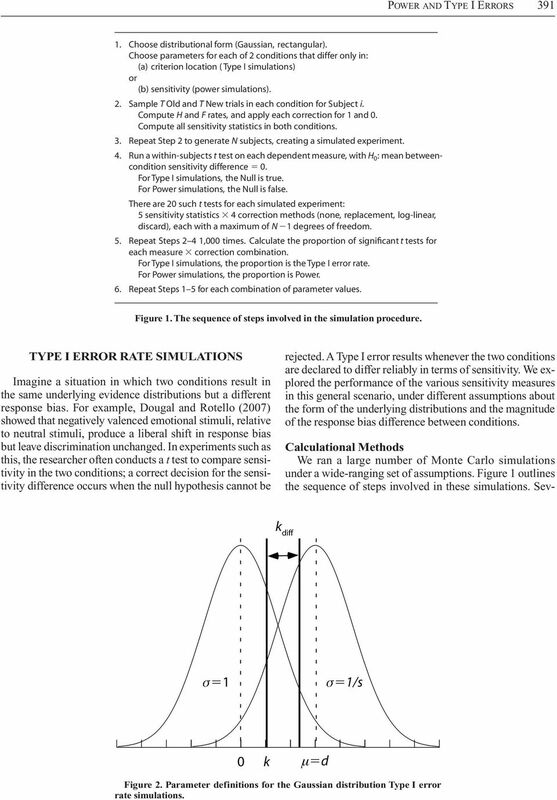 Type I error rate simulations for A, using the same parameter values as those in Figure 4. 7 Pow e r and Type I Errors 395 N N Figure 7. Type I error rate simulations for percent correct, using the same parameter values as those in Figure 4. N N Figure 8. Type I error rate simulations for log-linear d, using the same parameter values as those in Figure 4. 8 396 Rotello, Masson, and Verde Finally, Figure 8 shows the results of using log-linear d as the dependent measure. This measure, unlike the others, assumes that the underlying strength distributions are Gaussian in form. Consequently, it should perform better than the other measures we have considered. However, d is independent of criterion location only when the underlying strength distributions have a common variance, so we expect that log-linear d will perform well only when the slope of the zroc is.. Figure 8 supports this conclusion: The observed Type I error rate is near α when the slope is. and does not change with subjects or trials. However, when the zroc slope deviates from., d is dependent on criterion location, and therefore, the Type I error rate increases dramatically. (See Verde & Rotello, 23, for an empirical example of how this situation can lead researchers astray.) All is not completely well for log-linear d, unfortunately, even when the slope is.. As the true underlying sensitivity increases, the log-linear correction itself begins to affect the results, especially when there are small numbers of trials per subject. This effect is caused by either the hit rate in the liberal condition reaching or the false alarm rate in the conservative condition reaching and being adjusted by a relatively large amount (due to the small number of trials), which reduces the estimated value of d in one of the two conditions. Data in the other condition are adjusted to a smaller extent, so the estimated value of d is more accurate. Thus, an apparent difference in sensitivity is created by the correction method; the correction-based Type I error rate increases with underlying sensitivity, d. It should be noted that all of the correction methods we evaluated suffer from this problem. Rectangular distributions. Figure 9 shows the Type I error rates for γ, γ C, A, p(c), and log-linear d, based on rectangular distributions. In many ways, the results of the rectangular distribution simulations are predictable from the results of the Gaussian distribution simulations: Measures that assume underlying rectangular distributions perform well, and measures that assume other distributional forms do not. The error rates for γ are unacceptably high, and they tend to increase with the number of subjects and trials, as well as with the magnitude of the criterion location difference, k diff, and with true sensitivity, d (see the online figures). The reasons that γ fails here are much the same as the reasons that it fails with Gaussian underlying distributions: The data converge on an underlying representation that differs from the model that was used to generate the data. Again, no method of adjusting values of H 5 or F 5 reduces the Type I error rate, because the problem is structural rather than cosmetic. In contrast, the observed Type I error rates for γ C are consistently low. The success of this dependent measure is due to its underlying assumption of rectangular strength distributions (see Masson & Rotello, 27). Like γ, A fares poorly in these simulations. The observed Type I error rates are unacceptably high and tend to increase with both number of subjects and trials as the c A p(c) d Figure 9. Type I error rate simulations for all measures, assuming rectangular distributions, d 5.37, and k 5 5. Upper row, simulated subjects; lower row, 3 simulated subjects. Within each panel, the dashed line indicates α 5, and the solid lines reflect values of k diff : Symbols denote k diff 5 (plus sign), (open circle), and (asterisk). 11 Pow e r and Type I Errors 399 Gamma Corrected Gamma A Percent Correct d Figure 2. simulations for all measures, assuming Gaussian distributions, true sensitivity d 5, k 5, zroc slope 5., and 3 simulated subjects. Within each panel, the dashed line indicates power 5, and the solid lines reflect values of d diff : Symbols denote d diff 5. (plus sign),.3 (open circle), (asterisk),.7 (x), and.9 (square). Gamma Corrected Gamma A Percent Correct d Figure 3. simulations for all measures, assuming rectangular distributions, d 5.37, k 5 5, and 3 simulated subjects. Within each panel, the dashed line indicates power 5, and the solid lines reflect values of d diff : Symbols denote d diff 5. (plus sign), (open circle), and.3 (asterisk). 12 4 Rotello, Masson, and Verde When Distributions Are Unknown What if the form of the underlying strength distributions is completely unknown? In that case, a dependent measure that makes little to no assumption about the form of the distributions would be desirable. Two such purportedly nonparametric measures have been proposed: γ and A. However, both measures have been shown to be parametric (A, Macmillan & Creelman, 996; γ, Masson & Rotello, 27). Our simulations contribute to the strong recommendation that these measures be avoided: Regardconditions. When sensitivity and the number of trials are high, log-linear d exaggerates the differences between conditions and provides greater power than do the other measures; γ has the lowest power under those conditions. 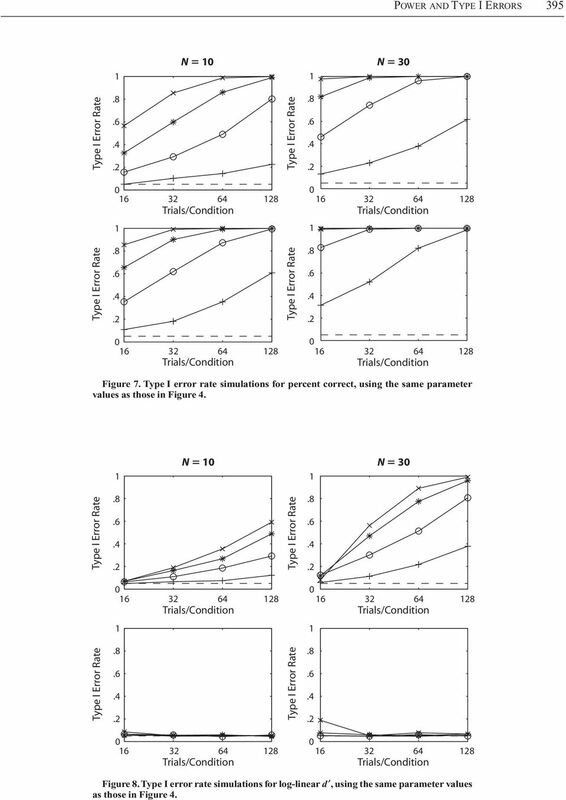 Discussion Unlike our Type I error rate simulations, these power simulations indicate that all the dependent measures perform fairly similarly. increases with subjects, trials, and the magnitude of the sensitivity difference between conditions; all of these effects are predictable. is also highest when sensitivity is low in the weaker conditions, perhaps because performance in the stronger condition is less constrained by a ceiling effect. 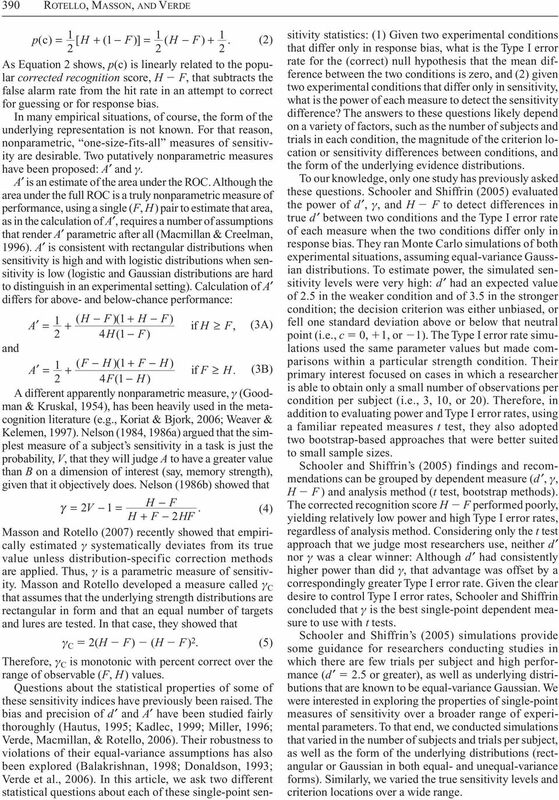 Although the power simulations suggest that A is the best choice of dependent measure, regardless of the form of the underlying strength distributions, Figures 6 and 9 clearly indicate that this power does not come without a cost: the Type I error rates for A are unacceptably high. Conclusions and Recommendations: Understand Your Data It is essential to choose a sensitivity measure that has properties that match the structure of the data to be analyzed. Some measures, such as percent correct and the new γ C, assume that the underlying strength distributions are rectangular in form. In contrast, d assumes that the underlying strength distributions are equal-variance Gaussian. Our power simulations indicate that all of these measures perform well, given sufficient numbers of subjects and trials. 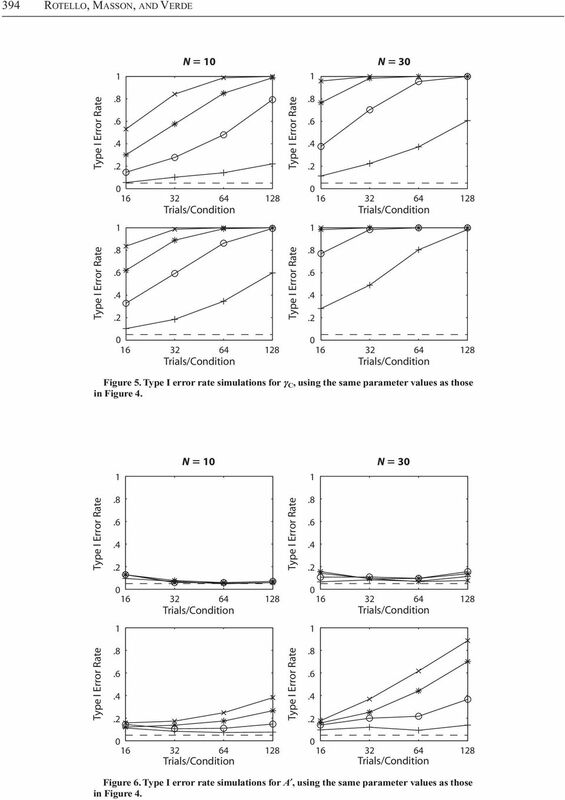 However, the Type I error rate simulations demonstrate that application of an inappropriate dependent measure dramatically inflates the likelihood that an erroneous conclusion will be drawn about sensitivity differences between empirical conditions. To minimize Type I errors, if the data are truly drawn from rectangular distributions, percent correct or γ C should be used. If the data are drawn from equal-variance Gaussian distributions, d should be used, and the overall sensitivity levels should be kept at a moderate level to avoid Type I errors that stem from the correction for s and s. If the data are drawn from unequal-variance Gaussian distributions, no single-point measure consistently yields reasonable Type I error rates. The best one may do in that case is to estimate sensitivity using d a (Simpson & Fitter, 973) or A z (Swets & Pickett, 982), if the relative magnitudes of the target (/s) and lure standard deviations () are known or can be estimated from previous research. These values can be calculated as follows: and da = s A z 2 / ( zh szf ) (6) da = Φ, (7) 2 where Φ is the cumulative normal distribution function. A z has particularly small standard errors and minimal de- viation from true values (Macmillan, Rotello, & Miller, 24; Verde et al., 26) and is an estimate of the area under the ROC. When Distributions Are Known In some empirical situations, such as some perceptual categorization tasks, the stimuli are drawn from artificially created distributions (e.g., Ashby & Gott, 988; Ratcliff, Thapar, & McKoon, 2). In that case, the form of the underlying strength distributions is obviously known (and can be manipulated); selection of an appropriate sensitivity measure is straightforward and follows the rules outlined previously. In other research domains, the form of the underlying strength distributions may be inferred from previous research in which ROC data were collected. Swets (986a) summarized the form of the ROCs observed in a variety of basic and applied research domains. 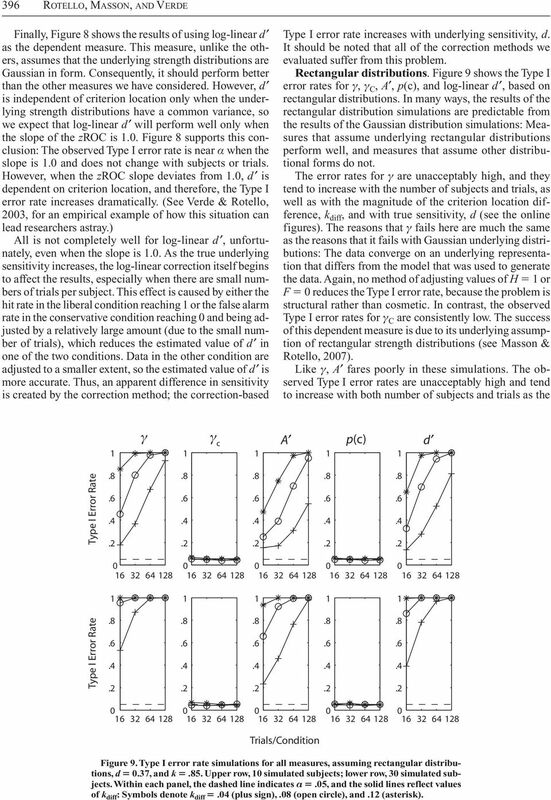 These ROCs were all consistent with Gaussian evidence distributions, although they sometimes indicated that the distributions were of equal variance (pure-tone detection), less often of unequal variance with a less variable target distribution (e.g., information retrieval systems, weather forecasting), and more often of unequal variance with a more variable target distribution (e.g., recognition judgments, decisions on radiological images). As we have noted, no single-point sensitivity measure performs adequately when the underlying Gaussian distributions have different variances; in that case, some information about the ratio of target and lure standard deviations is necessary to accurately evaluate sensitivity. Worse, apparently small changes in the stimulus characteristics or task structure can result in changes to the form of the ROC. For example, shifting the task from detection of pure tones in noise to detection of signals that are white noise samples changes the ROC from equal-variance Gaussian to unequal-variance Gaussian (Green & Swets, 966). 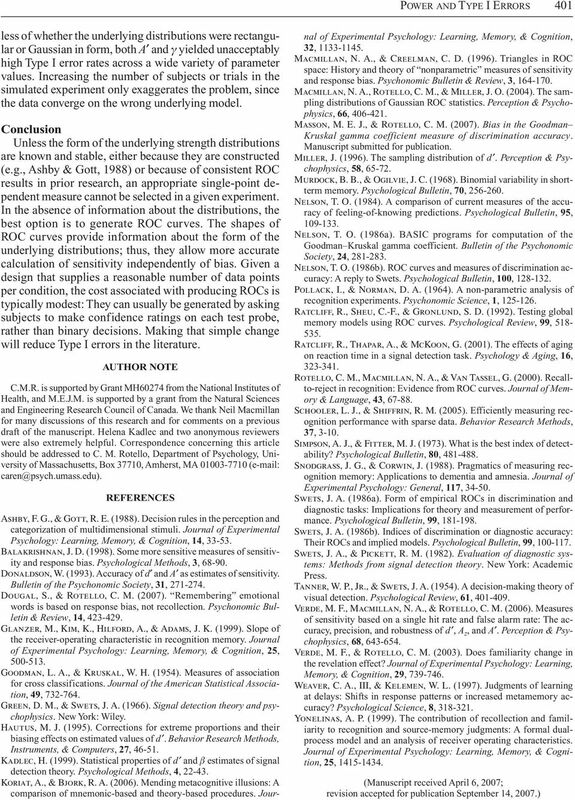 In the domain of recognition memory, changing the nature of the lures can shift the form of the ROC from being consistent with Gaussian distributions (when lures are randomly related to targets) to being consistent with rectangular distributions (when lures and targets differ in a single detail, such as their plurality [Rotello, Macmillan, & Van Tassel, 2] or the side of the screen on which they are presented [Yonelinas, 999]). 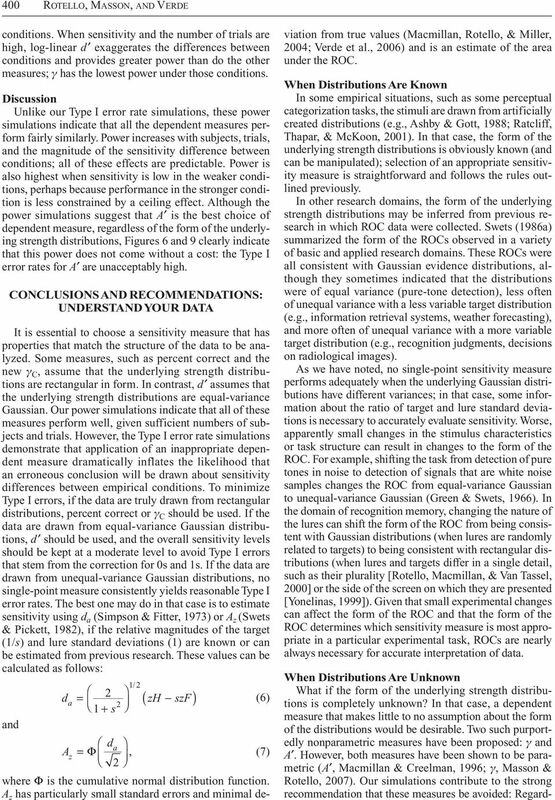 Given that small experimental changes can affect the form of the ROC and that the form of the ROC determines which sensitivity measure is most appropriate in a particular experimental task, ROCs are nearly always necessary for accurate interpretation of data. What Does the Correlation Coefficient Really Tell Us About the Individual? Chapter 4: Data & the Nature of Graziano, Raulin. Research Methods, a Process of Inquiry Presented by Dustin Adams Research Variables Variable Any characteristic that can take more than one form or value. 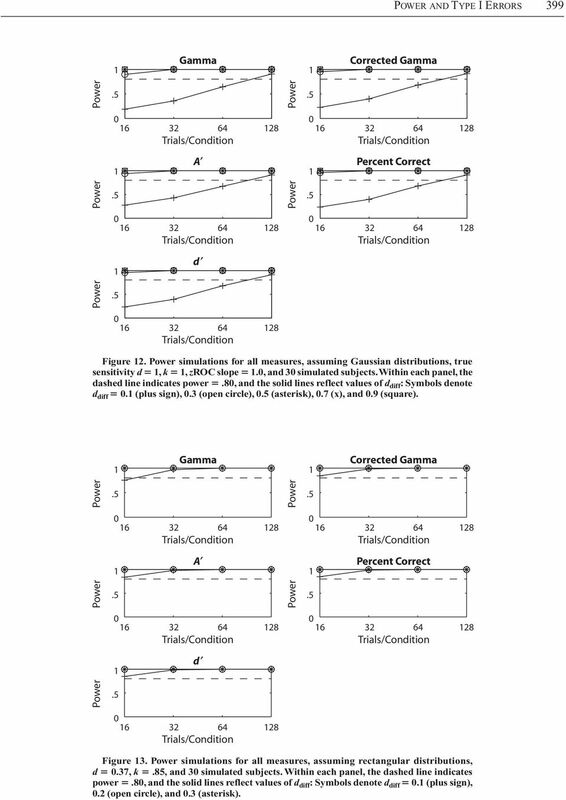 A Significance Test for Time Series Analysis Author(s): W. Allen Wallis and Geoffrey H. Moore Reviewed work(s): Source: Journal of the American Statistical Association, Vol. 36, No. 215 (Sep., 1941), pp. Correlational Research Chapter Fifteen Correlational Research Chapter Fifteen Bring folder of readings The Nature of Correlational Research Correlational Research is also known as Associational Research. TRANSCRIPT: In this lecture, we will talk about both theoretical and applied concepts related to hypothesis testing.